This cleansing oil is DHC's 'superstar' product. Ever since I came to know about cleansing oils, I've wanted to try this one as it'a very popular and gotten rave reviews. Claims: Try this amazing cleanser and you’ll see why it’s our most popular product worldwide. Dirt, excess oil, makeup—even waterproof mascara—and other pore-cloggers dissolve easily, leaving your face a grime-free zone that is soft to the touch. Its unique water-soluble formula rinses completely, so you’ll never see a greasy residue. Olive oil and vitamin E help ensure you won’t see dryness either. I've only tried 2 other cleansing oils apart from this. Biore Cleansing Oil & Mac Cleanse Off Oil. I loved the Mac one. Biore, not as much as the Mac, because Biore Cleansing Oil stings my eyes a little bit. DHC Deep Cleansing Oil is thicker than both of them, and it is yellow unlike them. It looks, feels, and smells, just like olive oil. It removes my makeup effortlessly quick without leaving any oily residue behind. I love how soft it makes my skin feel afterwards + it does not break me out. I believe it has anti-ageing benefits too coz of the olive oil & vitamin E, so I'd totally recommend this for those with aged and wrinkled skin. Actually, I'd recommend it to everybody & every skin type- normal, dry, combination, and oily. People with oily skin may be scared of putting oil on their faces, but I assure you that it will not make your face more oily. Note: My skin gets really oily in summers. How to use: I usually need just a pump to clean all my makeup- eyes, lips & face. I massage it all over my face, then move on to my eyes (even on my waterline and the inside of my upper lash line where I tightlined) and lips. When it has melted all the makeup, I wet my hands a little and run them all over my face over the oil. Water will turn the oil milky, like a thin lather. Lastly, I rinse my face with lukewarm water, dry, and done! Face wash needed afterwards? Only if there are some black stuff left around my eyes, otherwise I don't use any. Amazing, isn't it? No dryness or tightness afterwards. Just a super clean, soft & smooth face. One Con: It's expensive. I bought it for about Rs.1500 (200 ml) from Malaysia, although it's priced at $25. Smaller bottle is for $12.50. Worth it, but expensive nonetheless. I could have gotten a MAC blush, a drugstore makeup remover, 3-4 nail polishes or some bars of chocolates to munch on while I read my bank statement for that much. But I picked 'oil' that's made out of the ones I already have in my kitchen and my medicine drawer over all those things. It's a crazy world after all! Buy again? Definitely. Unless I learn how to make a ditto one =D. And no, it's not available in India at the moment. You'll have to head over to Ebay or sasa.com if you want it badly, and don't mind paying a little extra. Otherwise get the MAC Cleanse Off Oil (Rs.1180). It is just as good and smells better, in my opinion. I didn't know that DHC can be found in Malaysia where I live. I tried Shu Uemura cleansing oil which is pricy but contained mineral oil which is not good for the skin. I don't see mineral oil in the ingredient list of DHC, which is good. Do u still remember where u got this from Malaysia? may need to check it out. thanks for the great review. Any other reco for cleansing oils available in Delhi Cynthia?? Hey Lavender - it's available only at Watson's outlets in Malaysia. I've seen it and other DHC products at the MidValley outlet. 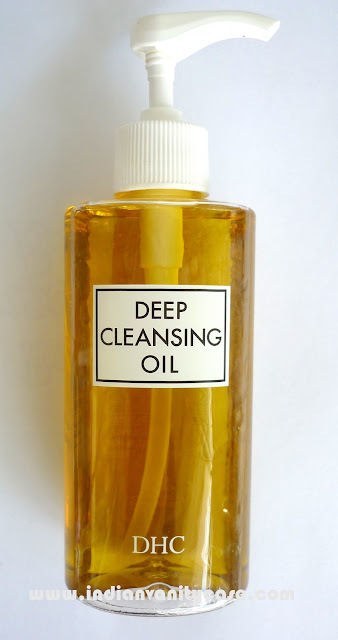 Deep Cleansing Oil is a fantastic cleanser - we've been using it for years. Fragrance free, paraben free and packed full of beneficial ingredients such as Vitamin E and Olive Oil. Its currently available ON SALE at www.innarbeauty.com along with other DHC skincare products.